Italian brand Smeg is well-known for its retro-style appliances but it also offers a large range of cooktops. Smeg cooktops, while not retro themed, are stated to combine quality materials and eye-catching designs along with cutting-edge technology. For gas, electric ceramic or induction cooking, read on to find out all the specs and features Smeg has to offer to complement your kitchen design. What cooktops does Smeg offer? Dimensions include 30 to 100cm with colour variations being white, black, cream or stainless steel and glass. Smeg again leads in design with elegant Classic, the “avant-garde” Linear, and Victoria styles in a range that incorporates different finishes, configurations and installation options. Smeg boasts a reputation for excellence in gas cooking, plus new features such as its vertical flame technology for optimum performance using minimal energy. 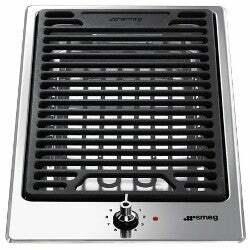 Smeg offers a huge number of gas cooktop options. In fact, it’s Smeg’s largest cooktop range, aiming to enhance your kitchen with unique character and style. Expect trendy designs – including a black finish – as well as super-efficient burner technology, according to Smeg. Smeg gas cooktops are available in brushed stainless steel, gas on glass, fingerprint proof, soft-touch acid-etched glass or enamel, plus are offered with different installation options, including flushmount, topmount, low profile and ultra-low profile. Flame failure device: fitted to all five burners, the device ensures that should a flame be extinguished accidentally, the gas supply to the specific burner or burners is stopped. For additional safety, the burner can only be reignited by physically resetting the control knob to the ‘OFF’ position. Low maintenance: the hobs are designed in a way that allows for easy wipe-over cleaning. In addition, control knobs are also removable for cleaning access, plus trivets, burner assemblies and wok stand can be washed in warm soapy water. It has electronic ignition, featuring a 1.3-meter power cord length to supply a continuous stored charge to spark the gas supply to the individual burner. It’s set up for natural gas but is also ULPT adaptable. Smeg’s electric ceramic cooktops are sleek and stylish to seamlessly compliment your kitchen. The cooking surface is claimed to achieve full heat in seconds. The range comes in various dimensions, from 30cm to 90cm and features touch controls or ergonomic control knobs as well as wipe-clean surfaces. 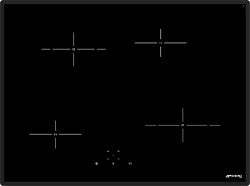 This 70cm ceramic cooktop is boasted for several key functions. Its ‘Go and Stop’ system is stated to apply full power for a brief initial phase before it turns to the pre-selected heat level for improved energy and time efficiencies. Each zone can be pre-set with an individual cooking duration (up to 99 minutes). When the individual zone’s timed cooking duration elapses, an audible end signal will emit. For safety, the cooktop will default to ‘OFF’ in any extreme conditions, such as a utensil cooking its contents dry or a continuous overflow of boiling fluids. Cooking can only be resumed after the issue has been removed from the electronic LED safeguards. For additional safety, in the same manner as the gas cooktop above, cooking cannot be resumed automatically, it requires a manual restart. The latest development in cooking technology is induction heating, which heats about twice as fast as gas and can simmer very gently. Smeg has an extensive range of induction cooktops that are boasted for a combination of “avant-garde” technology and stylish good looks. Smeg’s Active Surface Control is stated to automatically illuminate the relevant power control, no matter where the pan is located on the surface. The illuminated slider allows you to both touch directly or finger swipe up and down the one to nine power levels with no tapping required. There are three pre-set temperatures to choose from to help take the guesswork out of cooking – keep warm 42°, simmer 70° or rolling boil 94°C. After switching off the cooktop, it’s also possible to reactivate all of the previous settings with Smeg’s recall function. In a similar manner to the ceramic range above, this induction cooktop features automatic cooking and timers. Stop-cook timers can be activated for each zone while the ‘Go and Stop’ function heats a zone to full power and then automatically reduces to the level you have selected. You also have the option to pause the whole cooktop and return to your previous settings, if for any reason you need to leave the cooktop unattended, perhaps to check on the kids or take a phone call. For safety, Smeg’s SmartSense cooktops feature automatic cut-off and automatic spillage stop, plus touch control locks, child safety locks and residual heat indicators. Cooling fans also are stated to help ensure the temperature beneath the carcase is tempered and protects the electronic controls. In terms of maintenance SmartSense cooktops are boasted to be very easy to clean – simply with a damp cloth – as boil-overs don’t burn onto the surface. Smeg has designed this last range of 30cm-wide cooktops so that you create a personalised cooking area. From single-burners to teppanyaki plates and stone grills, you might find all the extras you need to amp up your kitchen. Expect gas, induction and ceramic options here. Is a Smeg cooktop worth the money? Smeg offers gas, ceramic and induction options for all types of cooking, plus domino style cooktops for that extra piece of equipment your chef expertise require. Most Smeg cooktops sit at premium prices, typically starting from $1,090 for the 30cm Domino range, while SmartSense induction models can go up as much as $4,590. However, with this you’ll find thought-through designs for easy maintenance as well as eye-catching looks. In addition, Smeg offers key automatic and safety features for convenience and peace of mind. If you’re after a tech-savvy cooktop with some style, a Smeg cooktop might be exactly what you’ve been looking for. However, if you’re on a budget you might like to look elsewhere. 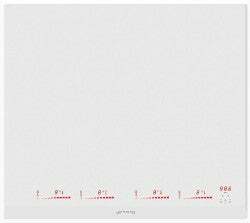 To see how Smeg cooktops compare to other brands, check out our online ratings via the link below.